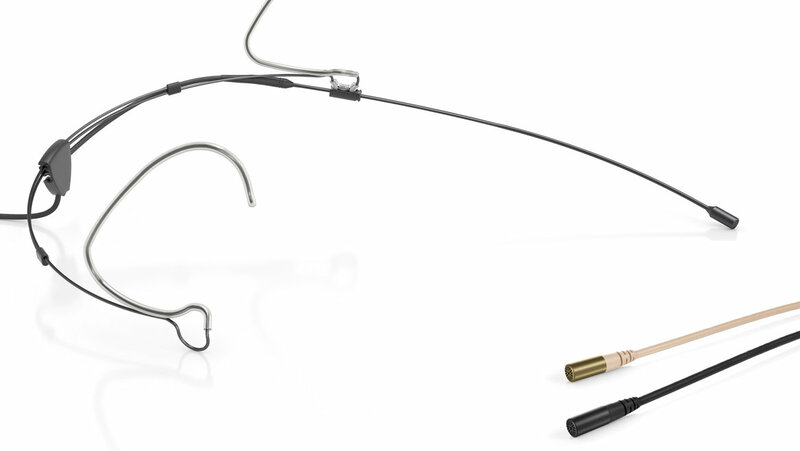 DPA’s recently launched 6000 series lavalier and headset microphones pack a powerful punch despite measuring just 3mm in diameter. Designed to be unobtrusive, DPA’s new subminiature microphone can be fitted to your talent’s clothes in the form of a virtually invisible lavalier or worn as an attractive headset that is comfortable, secure and so easy to fit even the most inexperienced presenter or performer can mount it themselves. With DPA’s exceptional sound quality guaranteed, speakers can relax and concentrate on the message they are delivering, safe in the knowledge that every word will be clearly heard. As a result of extensive research into the precise demands of the market, DPA has not only reduced the size of its microphone capsules but also introduced an innovative lightweight, one size fits all headset for the 6066. This new headset attaches over the ears for maximum comfort and has a three point, spring mechanism to help it grip below the ears and to the side of the head for added security. With a fully adjustable boom, it is very easy to fit and has a redesigned cable attachment that allows the cable to run down the wearer’s back, so it can’t be seen. For the d:screet™ 6060 and 6061 lavalier microphones, DPA has introduced an eight-way clip that rotates 360° degrees chosen in 45° incremental steps. Offering fast and secure mounting, this revolutionary clip makes it very easy to change the mics from women’s to men’s shirts (left- to right-buttoned) or attach the lavalier to t-shirts and the like where the neckline is used. DPA’s new 6000 series microphones will be on show at ISE Booth 7-X250 where the company is exhibiting in conjunction with its Benelux distributor Amptec. Alongside the subminiature products, DPA will also show its 4000 series lavalier and headset microphones that also feature CORE by DPA amplifier technology, which was developed to create an even clearer sound from the ‘highest of the highs’ to the ‘lowest of the lows.’ All CORE miniature capsules offer expanded dynamic range and, as indicated by their IP58 certification, are very durable and resistant to water and moisture thanks to nano coating and hermetic sealing of their sensitive electronics. DPA’s ISE offering will be completed with microphone products from its d:sign™ group that are specifically targeted at the Installation and Conference markets. Combining sleek design with high quality audio, microphones such as the d:sign™ 4098 and 4018 are the ideal choice for installation companies that need to create a functional yet aesthetically-pleasing meeting or conference space. The group includes functional yet unobtrusive table top, ceiling and floor stand microphones that ensure outstanding sound – even in acoustically-challenging spaces – and guarantee extraordinarily high speech intelligibility and clarity of voice in any room or situation. Visitors to the DPA booth will have the opportunity to test all of these DPA products via listening stations featuring the 4060 CORE and 6060 lavaliers, CORE 4288 and CORE 6066 headsets, the hand-held d:facto™ 4018VL, the floor standing d:sign™ 4018 and the table top 4098 and BLM 4060.